‘Tis the season…for truffles. 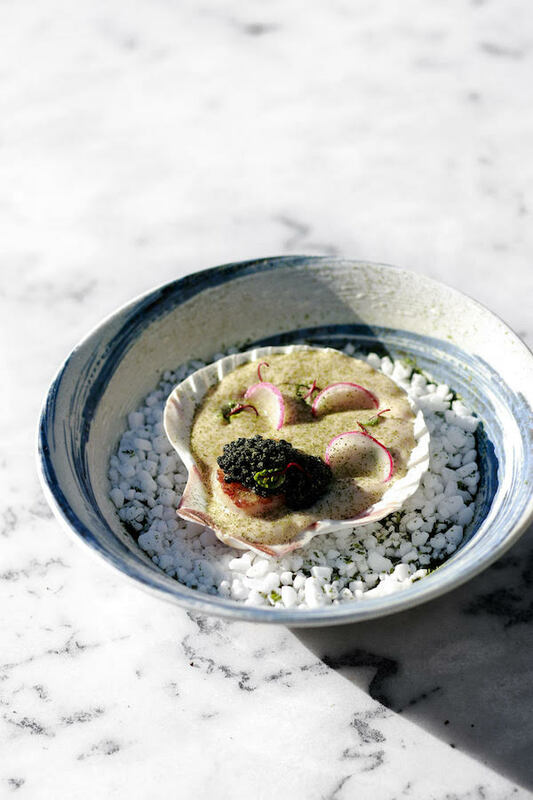 Prepare yourself for a tsunami of umami as chefs take everyday dishes to the most luxe level possible by incorporating an onslaught of fresh truffles. 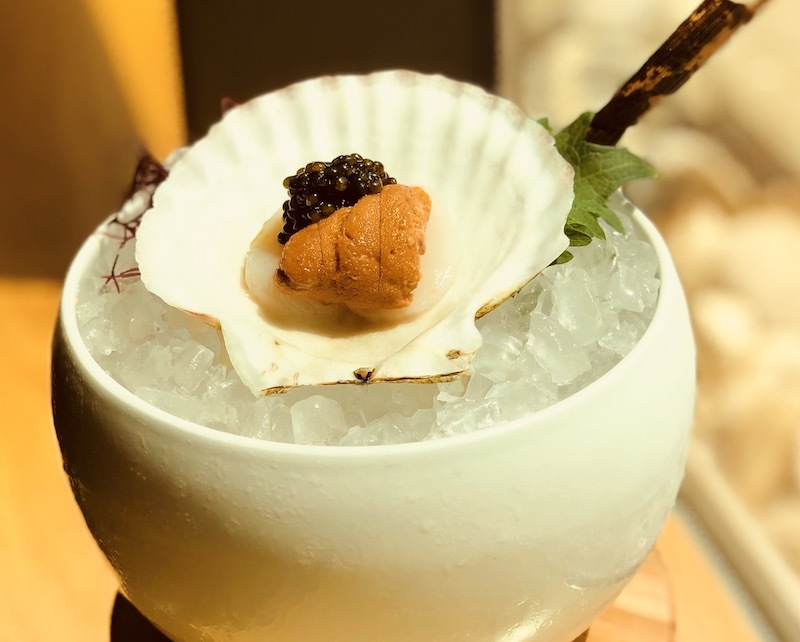 Whether you’re celebrating an anniversary or a birthday or, simply, the arrival of this delicious ingredient, these 12 restaurants for truffle season ensure that you’ll be living your best life. Not near any of these spots? We can help you find the right restaurant for a perfect meal on OpenTable.com. Briny, earthy, and umami notes come together in this deeply satisfying dish. To start, tagliolini is tossed with oyster beurre noisette. 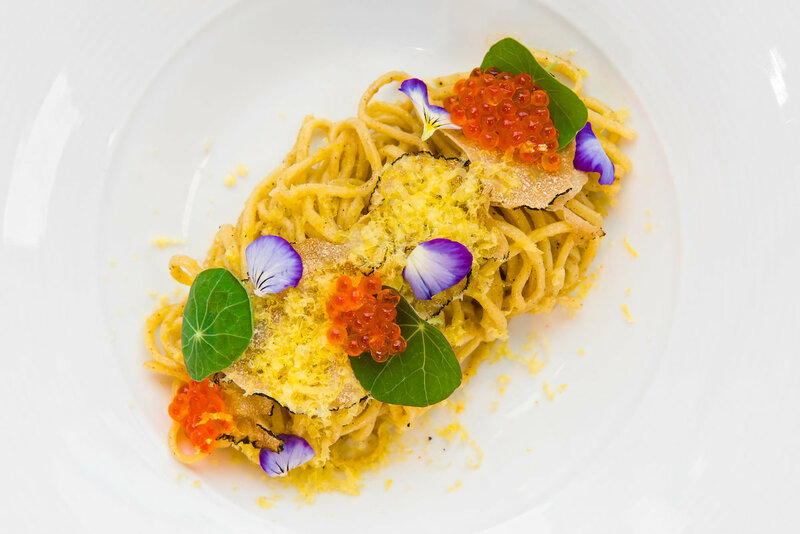 The tangle of noodles gets capped with freshly shaved black truffles, golden orbs of trout roe, and grated cured egg yolk. Make a reservation at Café ArtScience. In French, this dish is pâtes pappardelle à la truffe. That translates to housemade pappardelle tossed with truffle Mornay sauce, truffle zest, morels, and Comté cheese. 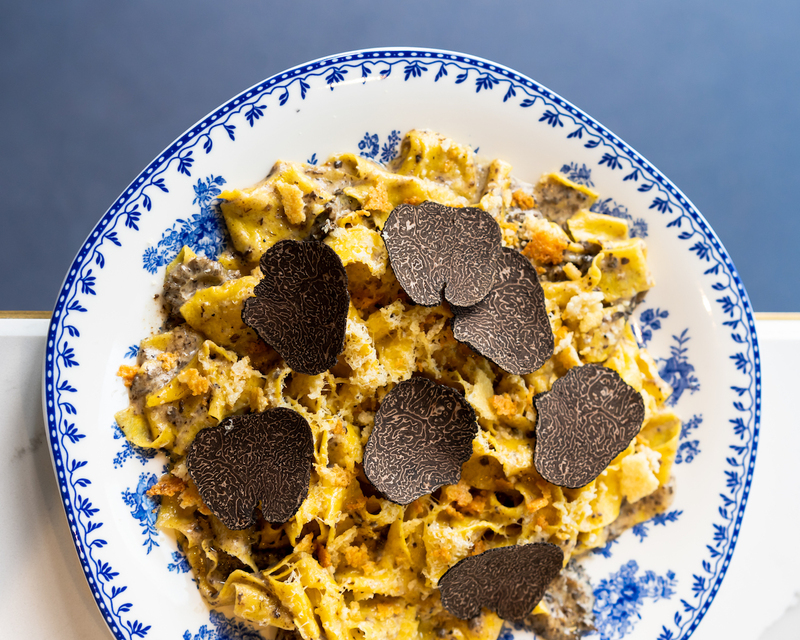 Shaved black truffles are optional, but why wouldn’t you? Make a reservation at Origo Club. Aged Parmesan risotto is already a baller dish. 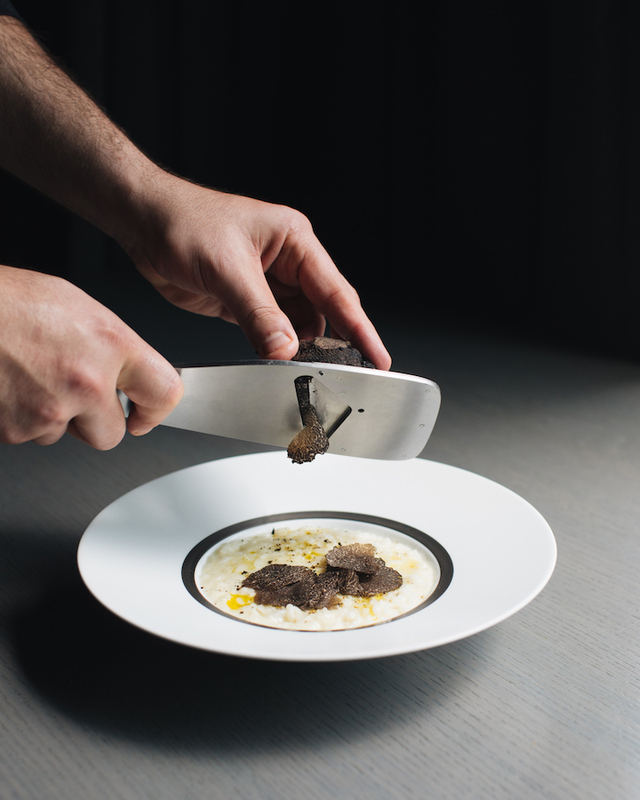 It’s taken to the next level with a storm of fresh truffles, which are shaved on tableside. Make it rain! Make a reservation at RPM Italian. Just because there’s no meat in this burger, doesn’t mean it isn’t ridiculously rich. 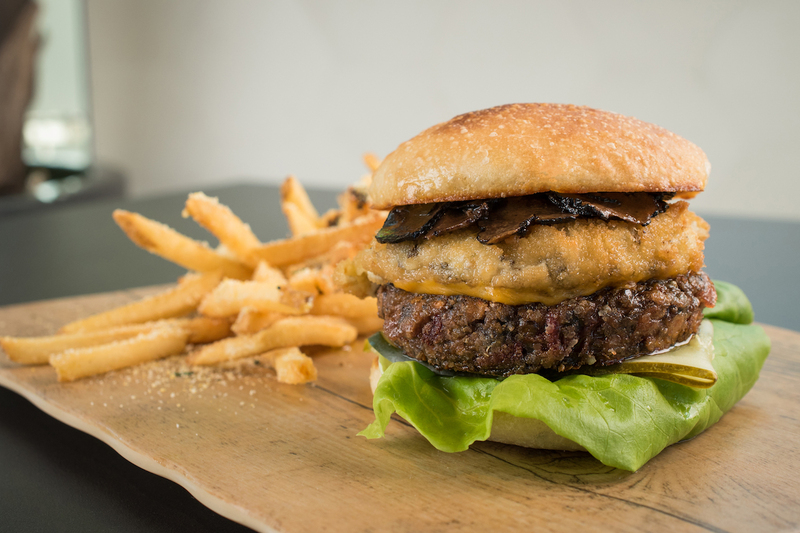 The patty is crafted from rooftop garden produce and then capped with a truffled cashew mozzarella melt. As if that weren’t enough, shaved truffles are the finishing touch. Make a reservation at Planta. It’s a nice day for Connie’s Wedding. 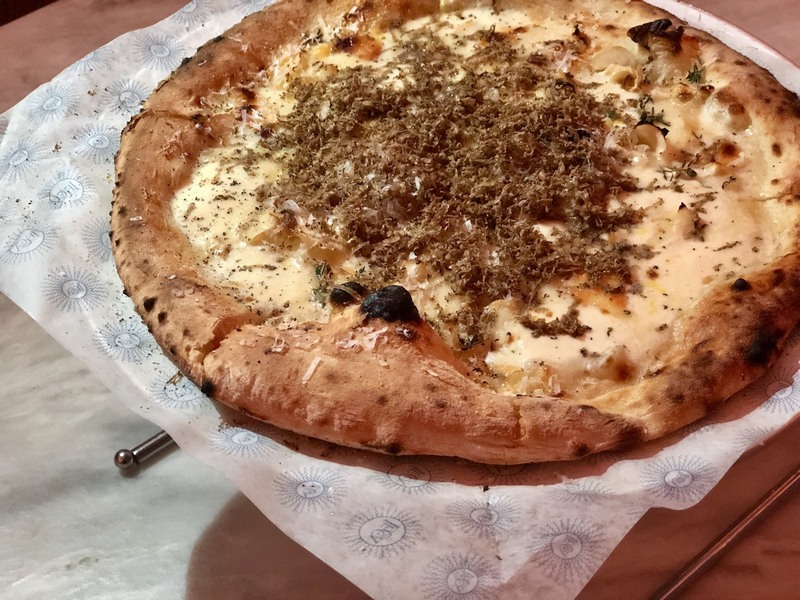 The primo pizza features mushrooms, Taleggio, and grated black truffles galore. So good, it’s almost as memorable as tying the knot. Make a reservation at Leuca. Do you know why they call it a Royale with cheese? 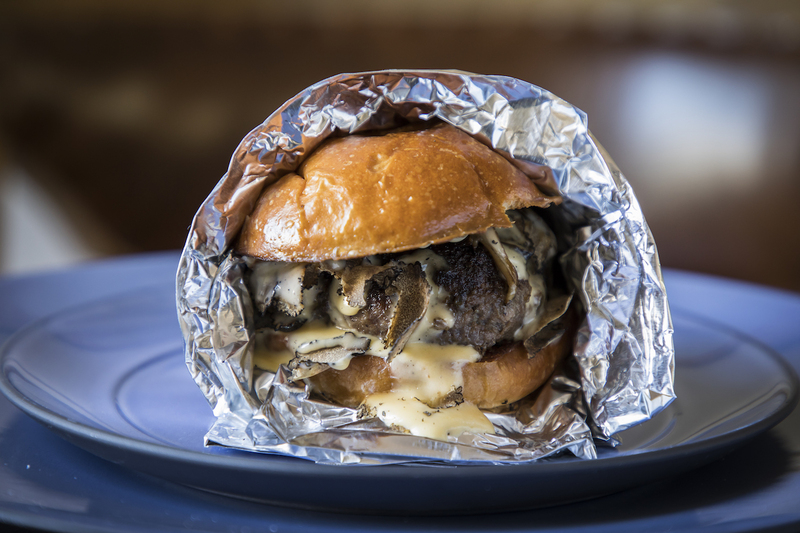 Because this Wagyu beef patty comes topped off with mushrooms, onions, Kraft Singles fondue, and shaved truffles? Correct! Check out the big brain on Brett. Make a reservation at Zero. Boudin blanc is one of the restaurant’s most iconic dishes. 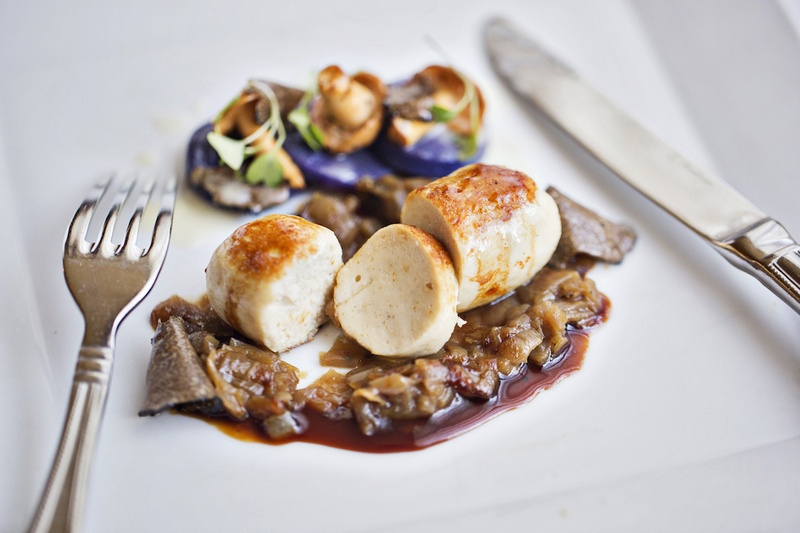 The svelte sausages are complemented by a luxuriant black truffle mushroom puree. Caramelized onions and bacon lardons complete the decadent dish. Make a reservation at Marcel’s. This is an umami bomb. 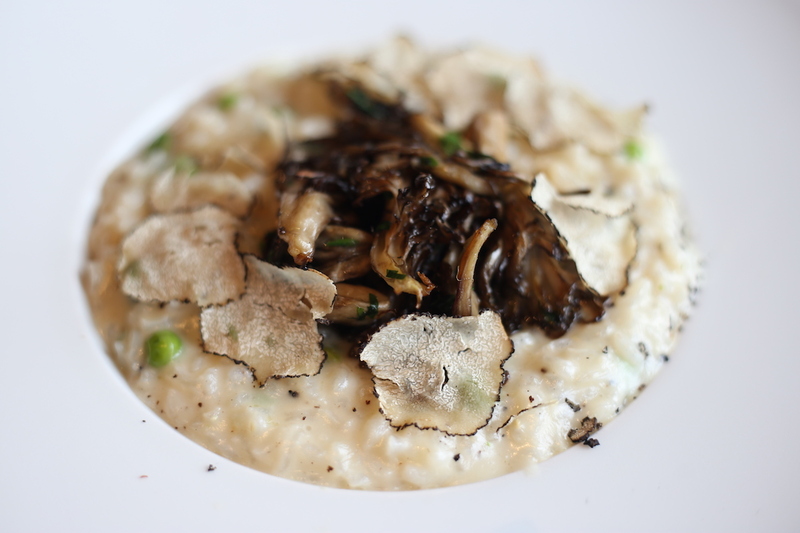 Rich risotto gets pumped up with earthy maitake mushrooms, asparagus, and new peas. Black truffles – or whatever variety is in season – add the finishing flourish. Make a reservation at Porter House. You’ve never had a pizza quite like this. 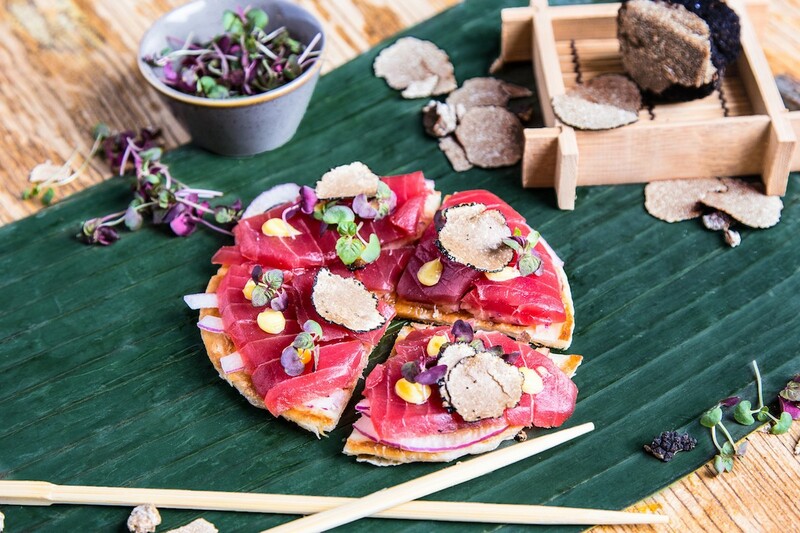 The petite round comes graced with tuna sashimi, truffled foie gras aioli, and freshly shaved black truffles. Bite into it for another surprise: the crust is actually roti. 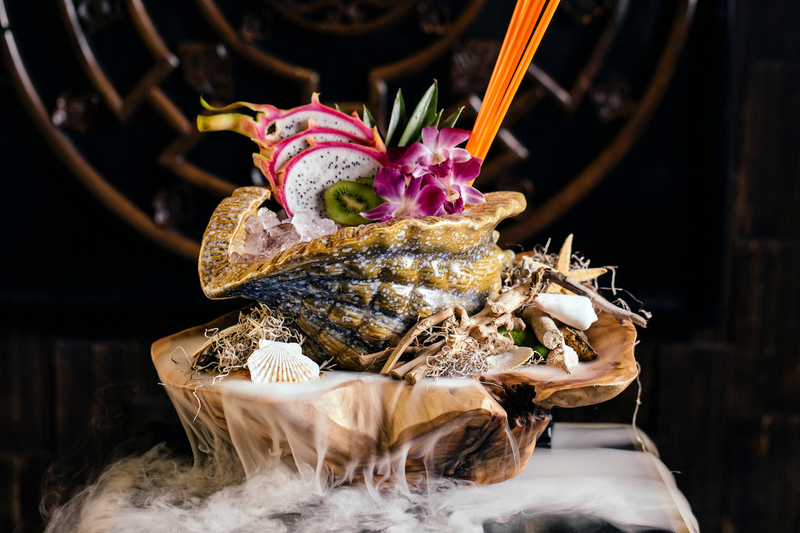 Make a reservation at Sunda. Thanksgiving dinner is usually all about emphasizing meat and animal products. For those diners maintaining a vegetarian or vegan lifestyle, this can make the holiday more of a helliday. Thankfully, plant-focused chefs are helping out by offering up veg-centric creations that rival the classics. 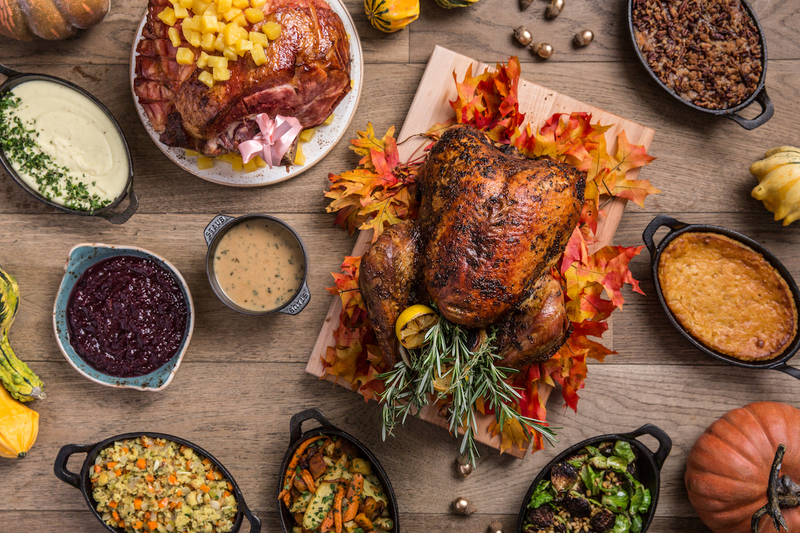 Here are 9 Thanksgiving restaurants for vegetarians and vegans that will make you feel right at home on November 22.If you’re not near any of these spots or you can’t find availability, we can still help you find the right restaurant for a perfect Thanksgiving on OpenTable.com. 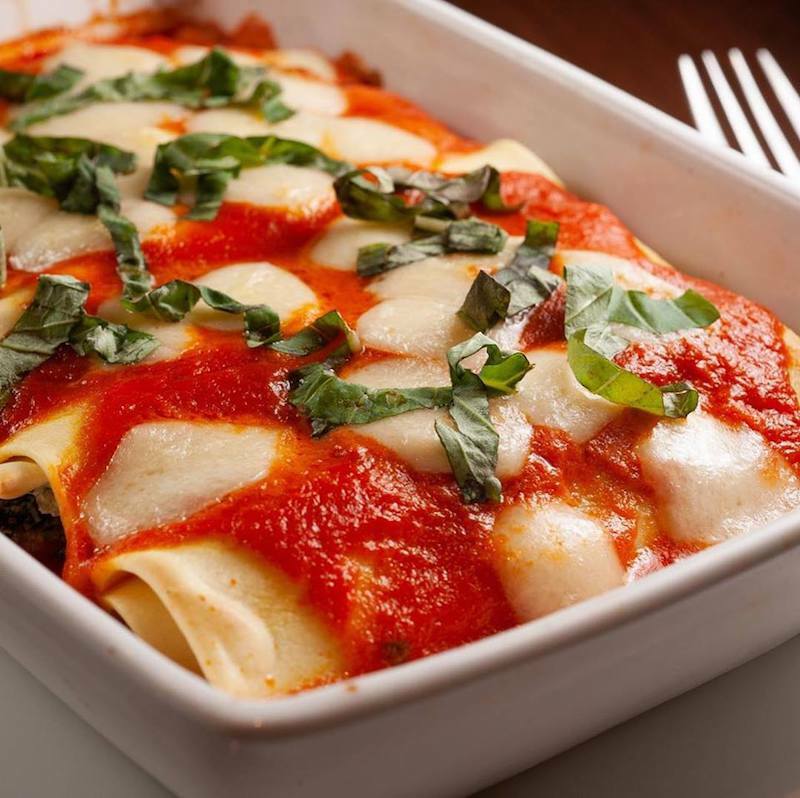 Vegetarian options abound on this Italian-minded Thanksgiving prix-fixe menu. There’s butternut squash soup topped with pickled cranberries and pumpkin seeds, creamy polenta crowned by a fricassee of truffled mushrooms, simple tomato and basil tossed spaghetti, and a slender apple tart sassed up with caramel and dulce de leche gelato. $85 per person; 12-8PM. Make a reservation at Scarpetta. 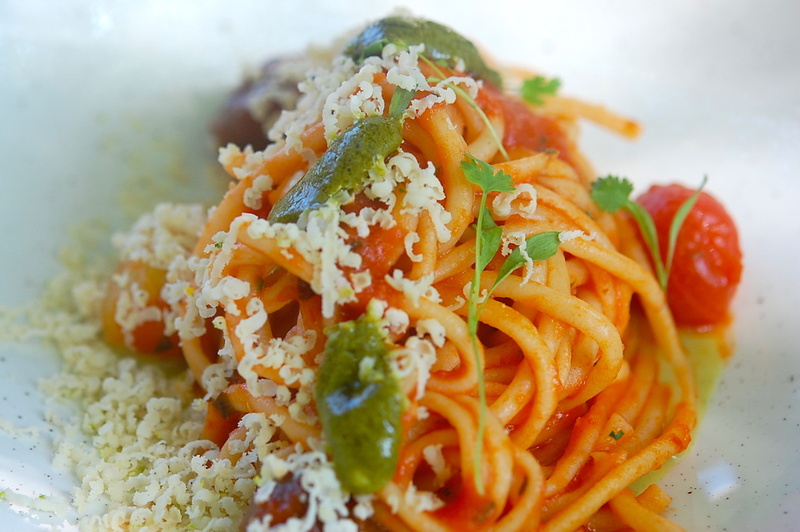 It’s easy to avoid meat at this Italian osteria. Veg-centric dishes include sweet potato soup, housemade pumpkin ravioli, burrata, and pastas, pizzas, and more. Just don’t forget to bring your stretchy pants. Make a reservation at Sette Osteria. Vegetarians have a few options at this four-course feast. 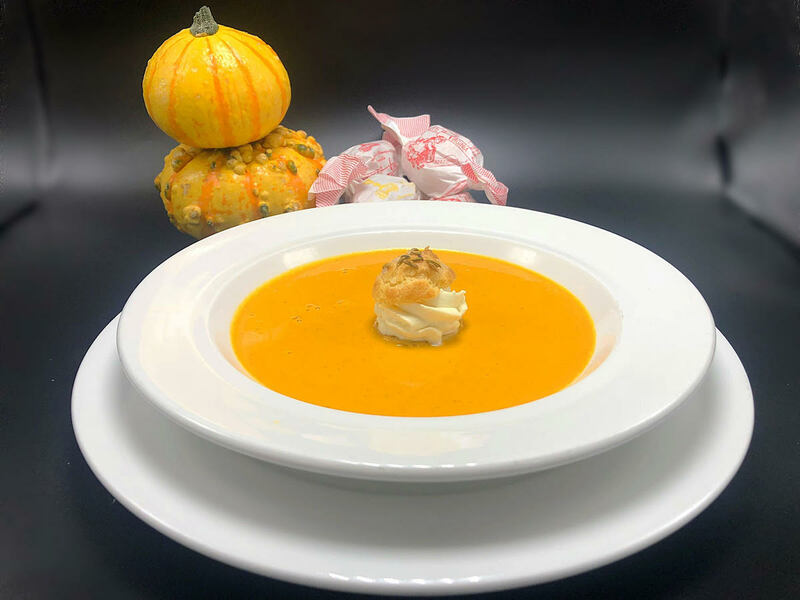 There’s endive and pear salad sporting blue cheese and candied pecans, fairytale pumpkin soup graced with an amaretto cream puff, and pumpkin bread pudding bolstered by maple crème anglaise. $49.95 per person for the four-course holiday menu; 11AM-11PM. Make a reservation at Mon Ami Gabi. A full three-course vegetarian menu is on hand to help the plant-forward crowd celebrate Thanksgiving. 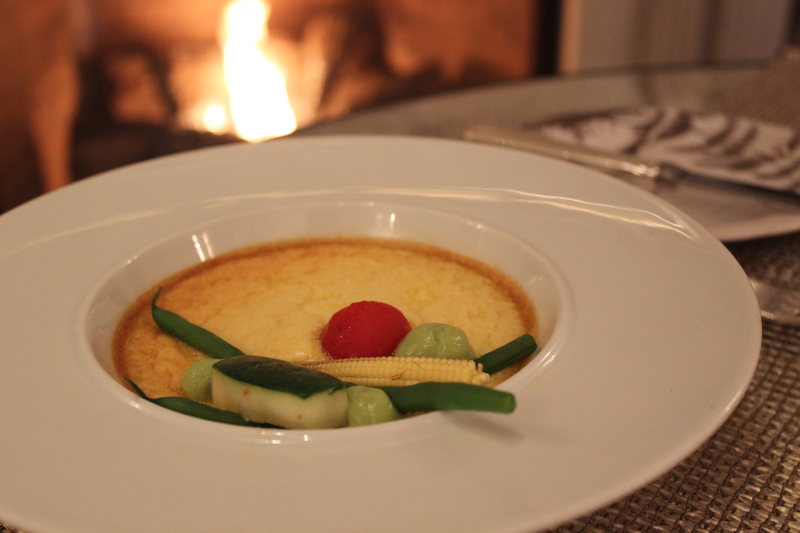 Dishes include yellow corn soufflé with a fall vegetable bouquet and warm endive salad with an orange gin marinade. $108 per adult, $48 per child aged 12 and under; 11AM-7PM. Make a reservation at Plume. 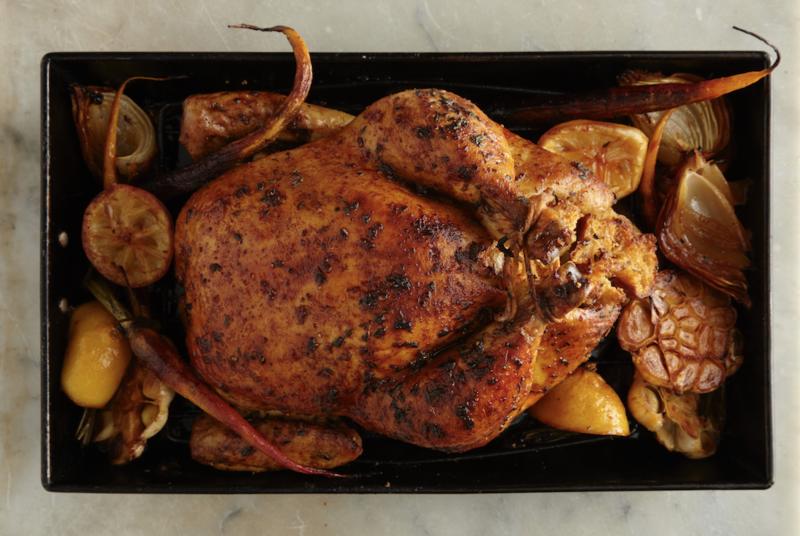 Día de Acción de Gracias is a Peruvian-minded Thanksgiving rife with vegetarian options. 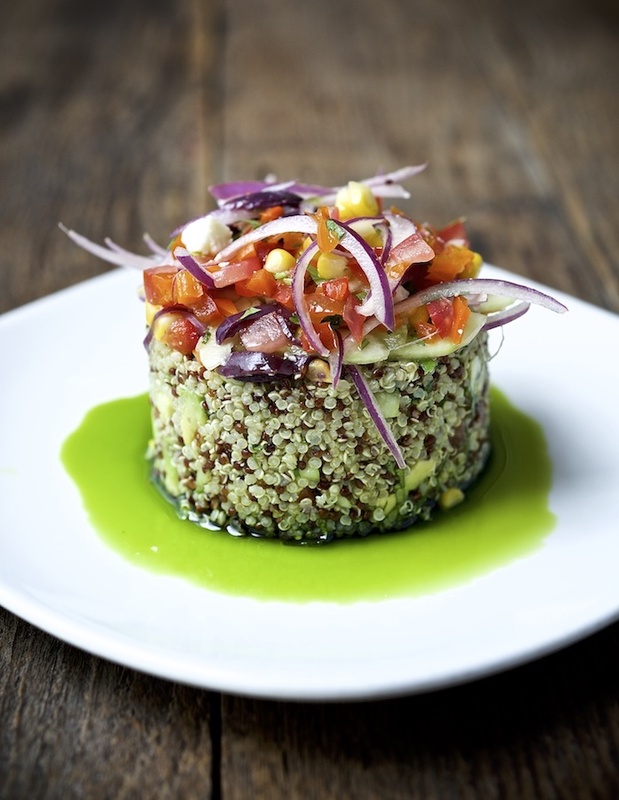 Plant-centric choices include lime scented quinoa salad, empanadas stuffed with braised chard, spinach, and mushrooms, quinoa risotto dressed up with golden beets and Hon Shimeji mushrooms, and apricot-coconut layer cake complemented by lucuma ice cream. $65 plus 20% gratuity per guest aged 12 and up, $32.50 plus 20% gratuity per child ages 5-11, children under 5 may order a la carte; 1-8PM. 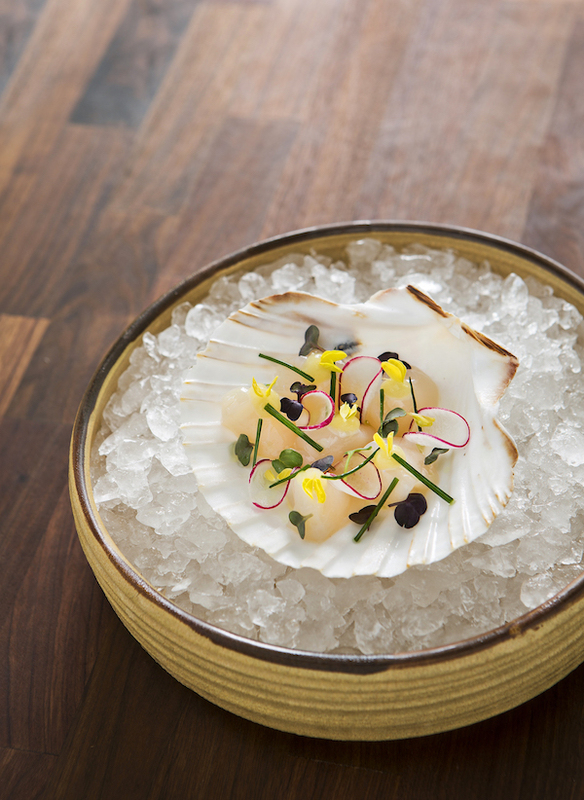 Make a reservation at Andina. You can have some of the meatier traditional fixings for this three-course dinner or you can have a plant-based meal. 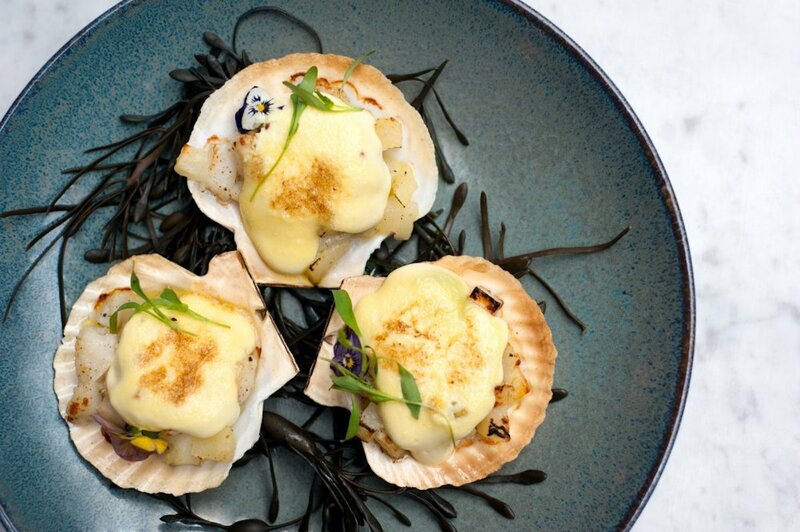 Animal-free options include chestnut porcini soup, brûléed fig and radicchio salad tossed with Creole mustard vinaigrette, bucatini lavished with smoked wild mushroom Bolognese and shaved cashew cheese, and vanilla-poached pear with spiced caramel. $75 per person. Make a reservation at Equinox. 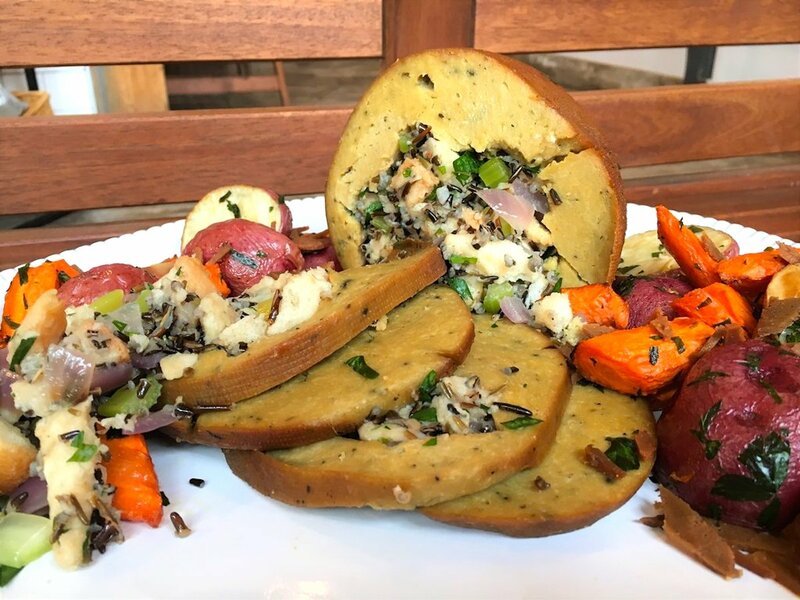 The restaurant partnered with the Herbivorous Butcher to add a bounty of vegan options to their Thanksgiving buffet. “Turkey” comes stuffed with stuffed with kale and mushroom wild rice dressing, and there is a slew of animal-free cheeses and charcuterie. #allveganeverything. 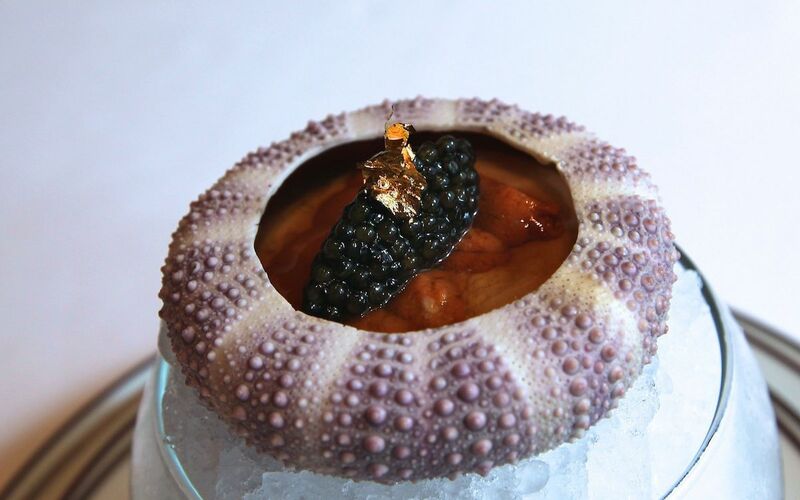 Make a reservation at Cosmos. Pretty much everybody loves Thanksgiving, pretty much nobody loves doing the dishes. Spare you and your guests the schlep, the prep, the struggles, the stress, and the scrubbing by making a reservation to eat out. 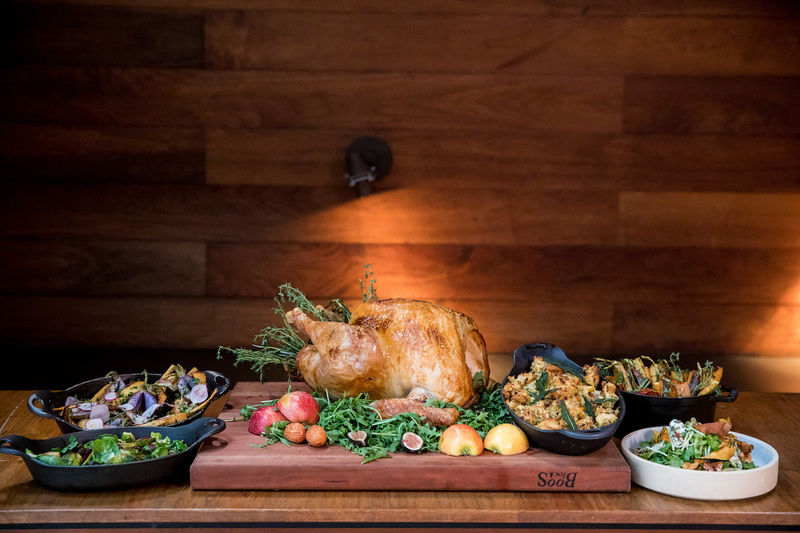 These 13 restaurants for Thanksgiving 2018 are serving up epic feasts that ensure you can all enjoy the day and each other without getting bogged down by any of the hassle. 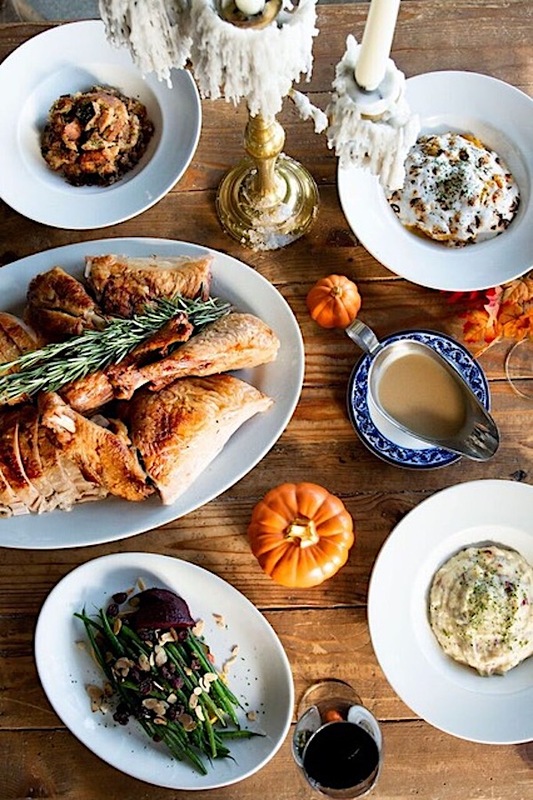 If you’re not near any of these spots or you can’t find availability, we can still help you find the right restaurant for a perfect Thanksgiving on OpenTable.com. The eats: The massive cuisine-spanning buffet features classics (herb butter basted roasted turkey, whipped Yukon potatoes, and charred Brussels sprouts tossed with lemon vinaigrette) alongside tacos and tamales, ramen, poke, and sushi. As if that weren’t enough, there are build-your-own crepes, cakes, cookies, and tarts for dessert. The deets: $155 per adult; $50 per child aged 5-12 years old. 12-8PM. Make a reservation at Travelle. The eats: Adults choose from elevated fare, such as butternut squash and mushroom tart, prosciutto wrapped turkey, yuzu glazed pork shoulder, pecan pie, and pumpkin cake. The special kids’ menu includes turkey breast with mashed potatoes, stuffing, and gravy, three cheese mac and cheese, and pumpkin pie cradled in hazelnut crust. The deets: $60 per adult; $20 per child aged 12 and younger. 11AM-8PM. Make a reservation at Trace. The eats: Classics galore are on hand, including roasted turkey, roasted butternut squash with marshmallow brûlée, sautéed green beans with toasted almonds and dried cranberries, and pumpkin pie with Chantilly cream. The deets: $49 per person. 5PM to close. Make a reservation at Kiki on the River. The eats: Start off with tuna tartare graced by house-made harissa before moving on to roasted turkey breast with braised leg, stuffing, pommes puree, cranberry sauce, pecan pie, and apple tart. The deets: $98 per person. Make a reservation at Dirty French. 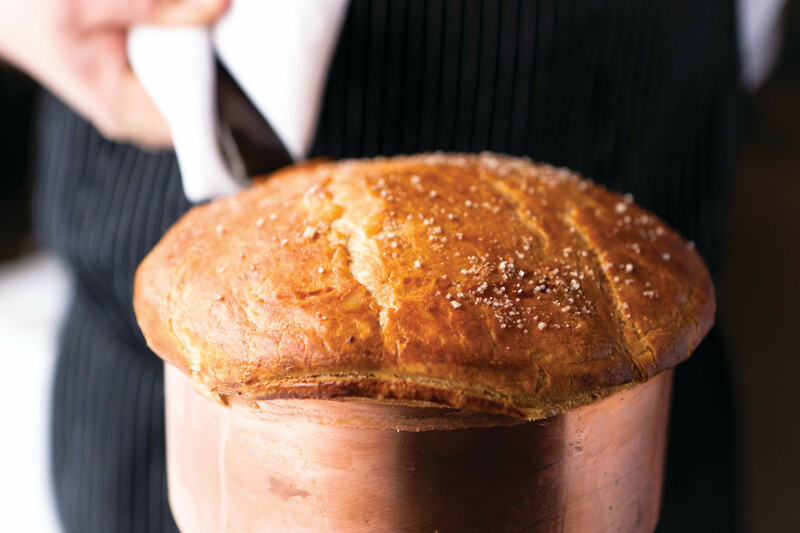 The eats: The extravagant three-course features luxe items like caviar and Champagne carbonara, wood-roasted filet of rib with black truffles, roasted turkey with black pepper Madeira gravy, lobster pot pie, and the tri-layer Bourbon Bar featuring brownie, caramelia mousse, and peanut butter. The deets: $120 per adult; $50 per child 12 and younger. Make a reservation at Bourbon Steak. 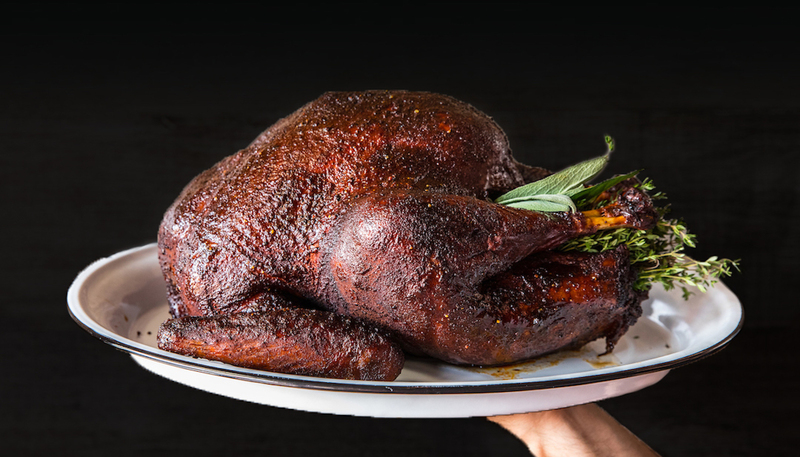 The eats: The four-course feast includes turkey two ways (roasted and fried), coal roasted king crab, chestnut stuffing, Japanese olive beef, pumpkin pie, roast pear tart, and the restaurant’s 14K chocolate cake. The deets: $90 per adult, $40 per child. 11AM-8PM. Make a reservation at RPM Steak. The eats: This wide-ranging buffet includes spiced butternut squash soup, salads galore, herbed turkey with giblet gravy and pear cranberry relish, beef Wellington, apple cider glazed bone-in ham, a slew of sides – garlic mashed potatoes, cornbread stuffing pocked with chorizo, and sweet corn casserole – and traditional Thanksgiving desserts. The deets: $99 per adult, $49.50 per child aged 6-12 years old. 12-6PM. Make a reservation at Terra.